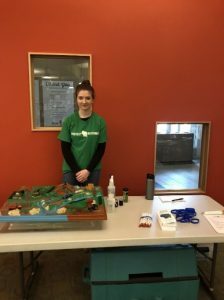 The Protect Wisconsin Waterways crew had a very successful event at the 2018 Beloit Public Library Earth Day Event on April 21! Our team engaged with families and children who were interested in learning more about Protect Wisconsin Waterways. We showed children the adverse effects of stormwater and told them how they could protect our waterways with the help of their parents and on their own. We used the Enviroscape to show event attendees many pollutants that affect stormwater. After hearing a short presentation on the Enviroscape.